When I first saw the list of October recipes for French Fridays with Dorie, this Hachis Parmentier was the dish I was most excited to make. The photo in Dorie Greenspan's book is just mouthwatering. 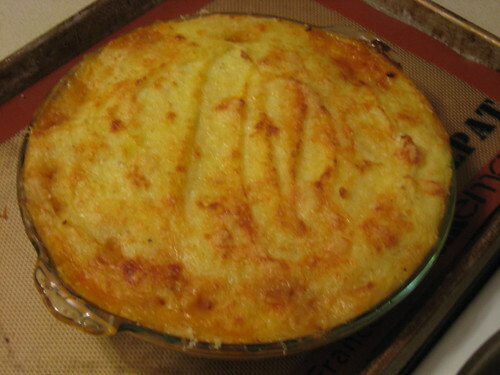 Hachis Parmentier is basically a French shepherd's pie, and, as I discovered when I made this for dinner, it is wonderfully warm and comforting. 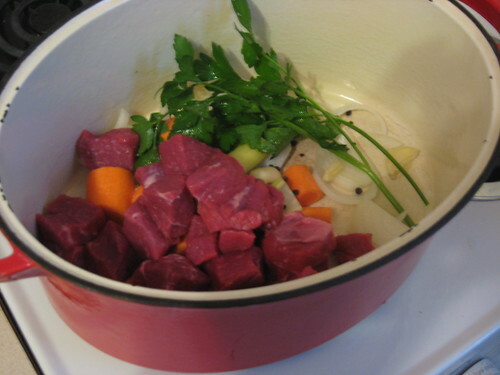 The base for Dorie's version of this dish starts with a quick scratch-made bouillon and chunks of beef, and it is enriched with the addition of sausage. This meaty filling is topped by a layer of creamy, rich mashed potatoes and further gilded by a sprinkling of gruyere and parmesan. Because I am a chronic member of Weight Watchers, I made a few adjustments to reduce the calories of my dish. I reduced the amounts of oil, butter, and cheese, swapped half and half for cream, and used chicken sausage in the filling, but it was still plenty rich for our tastes. 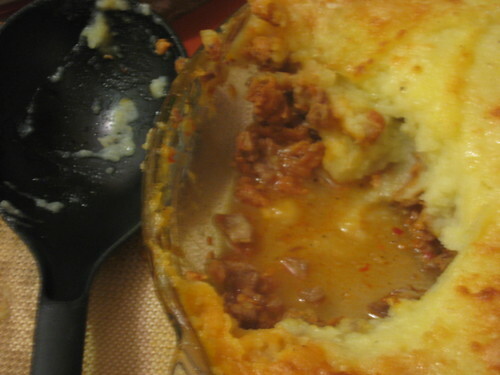 Also, my Hachis Parmentier ended up having an unplanned Latin twist. I asked the butcher at Whole Foods for the hot Italian chicken sausage, but when I unwrapped my package I found two bright red links of chorizo. Since I was already halfway through the cooking process, I decided to roll with it and we had a decidedly red, paprika-infused filling. I worried that the chorizo flavor was overpowering, but it didn't stop any of us from having seconds. I definitely want to make this dish again, though I will buy a more mildly flavored sausage. 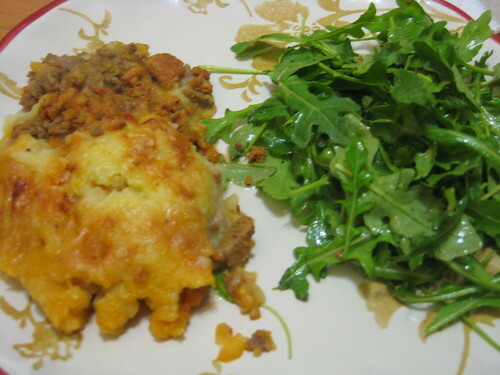 I did like the chorizo version, but if I were going to use it again I would probably change up some of the spices, perhaps use sweet potatoes in the topping, and give it a sprinkle of shredded manchego. The fact that this dish is so open for experimentation is another aspect of the recipe that I like. The filling could be bulked up with vegetables or flavored with some dry red wine or fresh thyme. However you choose to make it, a scoop of this partnered with a big vinaigrette-dressed green salad (I made mine with whole grain Dijon mustard) makes a delicious and hearty meal. Just don't expect too many leftovers; seconds are too good resist. For the recipe, pick up a (gorgeous) copy of Around my French Table, and click over here to see how much my fellow FFwDers liked their Hachis Parmentier.